Seriously great, and that's coming from someone who has never enjoyed a lemonade based commercial juice. The LA Lemonade and Lemon Sicily may be the perfect lemonade base to branch off of too. Great work here! Went through nearly 100ml in 4 days. Great fresh realistic pink lemonade. Awesome in this summer heat and no steep needed. As some others said I wouldn't make large batch as it does fade with steep. Great one here. As already stated in these reviews, this recipe is really meant to be a SNV. Over time the qualities that lemon sicily and the raspberry/strawberry combination add will fade, and you will be left with a mildly pink LA lemonade. 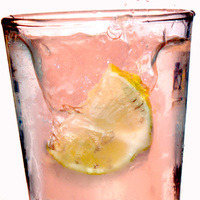 It is a solid recipe though, and the combination of raspberry and strawberry add a great "pink" flavor to the lemonade. This is a staple summer recipe. Flavor is realistic and well balanced. The raspberry/strawberry combination creates a great berry to bring the pink to a great lemonade base. Definitely in my top 3 fruit vapes which is saying a lot! Killer recipe, very nicely balanced although I found it a bit harsh on the throat. After mixing this up a few times I decided to replace the strawberry ripe with regular strawberry TPA which I find smooth as butter and added 0.2% of cactus. It was a total game changer now its silky smooth and juicier while retaining the exact same flavor as before. Great recipe, an easy 5 stars! Before I say something that might be misconstrued as "don't mix this" - MIX THIS! But don't mix too much; the notorious fading of FA Lemon Sicily and the muting properties of Strawberry Ripe combine in a perfect storm of recipe degradation. It falls apart in about 3 days. Easy solution; don't make more than you can vape in about 3 days. Start vaping immediately; it's a true shake and vape recipe. During those days; enjoy a sublime blend berry and lemonade. The lemonade base itself is more CountryTime than anything an actual lemon was involved in creating, but there's absolutely nothing wrong with that. Who doesn't love a nice cold glass of CountryTime Pink Lemonade at the end of a hot summer day, right?! This is that, done perfectly. To make it even better than perfect add some coolant of your choice -- I made a second batch with 1.5% WS-23 (30% solution in PG), but FA Polar Blast would probably be good too -- and get refreshed AF. For me this is the king of lemonade bases with a little raspberry and strawb added. This whole recipe is absolutely amazing but the fact that I got a wonderful base to play around with out of it makes me supremely happy. It tastes like element's pink lemonade minus the abhorrent amount of sickly sweet on the exhale. For anyone who likes lemonade it's a dream come true and a perfect spring or summertime vape. I'm relatively new to the vaping community, since November. After spending hundreds of dollars on e-liquid I've decided to start making my own. Spent lots of time researching recipes and chose this recipe as my first. It turned out amazing! First bottle ever. Made another for a big cloud lover and he said it's great for clouds. Thanks for making my first diy experience a great one! I'm an extremely tough critic of all e-liquid, especially my own. I'm always sceptical of other people's recipes, as a lot are pretty bad. I've been trying to come up with a good lemonade flavor for a while now. I have everything except raspberry sweet, so I decided to sub INW raspberry at 1% as its pretty strong. I mixed it, immediately dripped it into some fresh cotton, and it is by far the best damn pink lemonade I've ever had. I can't say what the original recipe is like exactly, but ican imagine that with sweet raspberry is even better. Kudos Vurve. This is some seriously good stuff. Barely got the LA to mix this and wished I would of gotten it sooner for the summer. Nice sweet lemonade with the right mix of fruits. I know what I'll be vapeing this summer. Love at first mix! Though I continue to chase the lemonade dragon, nothing I've made comes close to the unfussy perfection of this one. Tart and sweet deliciousness, and, the best part to me is that the strawberry & raspberry add interest without taking away from that crisp, bright, refreshing lemonade taste.